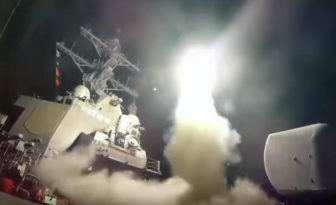 Other Connecticut lawmakers were more supportive of the strikes, but called on the White House to seek authorization from Congress for further military action and devise a “comprehensive” strategy on Syria. Murphy’s criticism of President Donald Trump’s decision to strike Syrian targets Friday night was based both on the military strategy of the operation and on the president’s failure to secure approval from Congress for the attacks. The U.S. airstrikes, launched in coordination with France and the United Kingdom, followed a week of threats by Trump of retaliation for an alleged chemical weapons attack on civilians by the Assad regime. They occurred a year after the United States hit Syria with an airstrike in response to a similar attack on Syrian civilians. “A perfectly executed strike last night. Thank you to France and the United Kingdom for their wisdom and the power of their fine Military. Could not have had a better result. Mission Accomplished!” Trump said. A short while later, U.S. Ambassador to the United Nations Nikki Haley said the United States is ready to keep pressure on Syria. “President Trump should read up on early days of the Vietnam war, when U.S. leaders were sure that airstrikes, along with a small presence of ground troops, would cause the North Vietnamese to end their assault on the South and come to the negotiating table,” Murphy said. 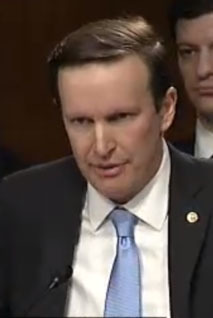 Murphy said the United States should “complete its mission against ISIS in Syria” and pull back its military effort, participating in diplomatic efforts to end the war instead. Sen. Richard Blumenthal was also critical of Trump’s policy toward Syria. Blumenthal said “robust diplomatic, economic, and humanitarian efforts,” must accompany a U.S. military campaign against Assad. Most congressional Democrats said one night of airstrikes was not a substitute for a comprehensive U.S. strategy on Syria. They also called on the White House to seek congressional authorization for military action. But Courtney also said “from this point on, the Trump administration needs to consult with Congress on what the overall strategy in Syria will be, a question that is far from clear and one I raised with [Secretary of Defense James Mattis] this past Wednesday during a hearing of the House Armed Services Committee. “However, any military action is tantamount to an act of war, and Congress bears a constitutional responsibility to address the administration’s authorities before any further decisions are made,” Larson said. Like other Democrats, Larson called for House Speaker Paul Ryan, R-Wis., to bring up legislation that would define and limit the military action the Trump administration used in Syria. Meanwhile, most Republicans gave their full support to Trump’s action.